You can also see what I made with leftovers — cute little hats or poop-ies, that you can place on top of a cupcake, or stick a mini-flag saying "Love me" in them. A great ice-breaker! 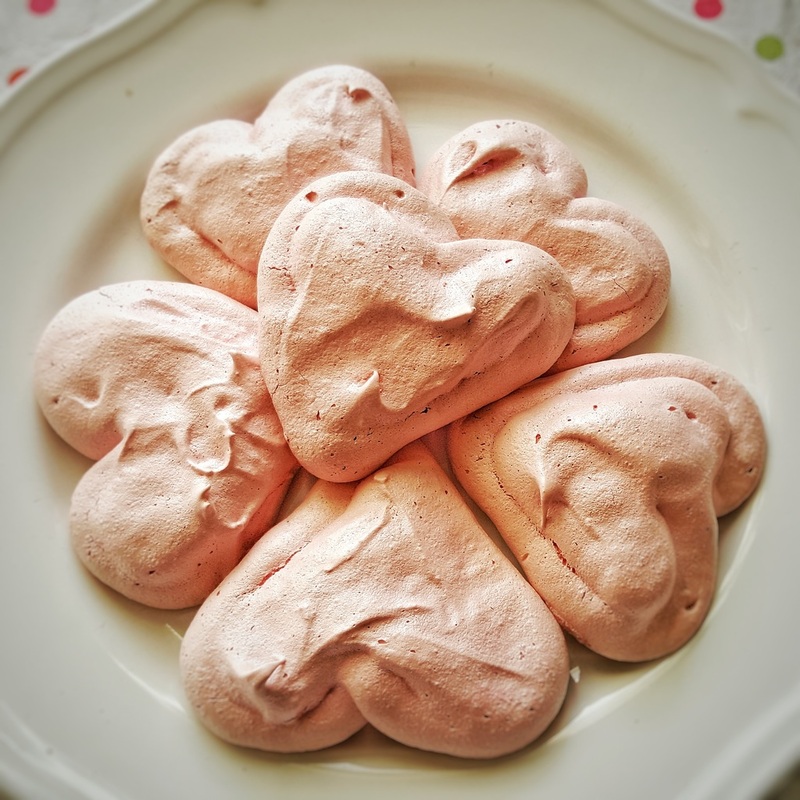 Let's start by making the meringue: place egg whites in a large bowl, add sugar and a pinch of salt, and mix with a mixer on low speed to dissolve some sugar. Keep mixing on high speed until the foam is firm, then add vanilla extract and food coloring. Mix everything thoroughly to make sure all of the food coloring is distributed evenly. Spoon by spoon, place all of the beaten egg-whites into the bag, then turn it back, shake gently up and down to remove excess of air inside and twist the end to close it. Using a template (or free-hand) pipe heart outlines on the parchment paper, about 10cm-wide, 3-4cm apart from each other. Fill the insides then to make it look like a cookie, and using a spatula or palette knife, level it out or be creative and make decorative waves. Make sure that you fill your pastry bag in one go, because it will be super messy if you decide to unwrap the ending and fill it some more. Turning half of the pastry bag inside-out will make it on the other hand super easy and clean to fill the bag completely, because you will end up with half of the bag clean and stain-free. Preheat your oven to 150°C (302F) and place baking sheet in the oven, then immediately turn the heat to 100°C (212F). 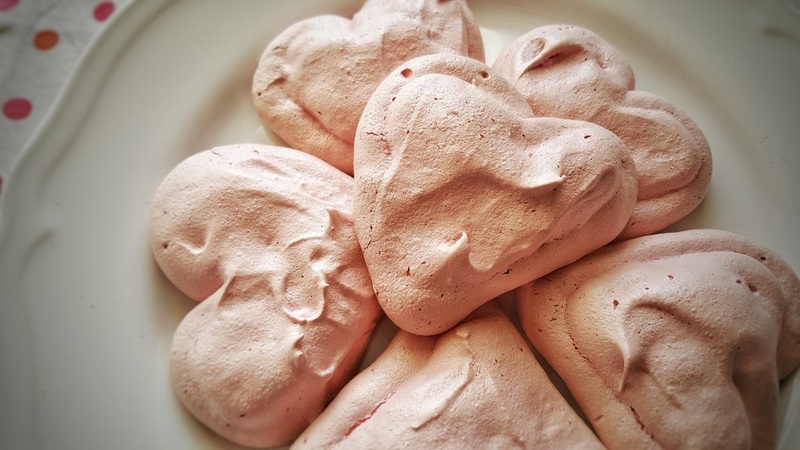 Bake for 30-40 minutes or until easily coming off the baking paper, but after 25 minutes check the color of the meringues, it shouldn't get brown or much darker than the initial color! After that time, remove the tray from the oven and let it cool down completely, then gently remove each heart from the baking tray.